There is no shortage when it comes to curated whisky services catering to the consumer’s every whim. Services that proffer samples, ones that send you bottles of different expressions in a bid to educate your palate and enable a deeper appreciation of the water of life, et cetera et cetera. Then there is The Whisky Club. The premise and underpinning idea behind the foundation of the club is that there is a myriad of superior whiskies in the dens of Scottish and Irish distilleries that one never gets exposed to, let alone have a chance to sample dram on terra australis. In a day and age where whisky in all its variations has undergone a renaissance of epic proportions and the public demand outweighing the available stock in the mother countries, other countries have established themselves firmly on the firmament of great whisky producers, e.g. Taiwan, India, France, Sweden or Tasmania. The Whisky Club works with the premise to offer its members the chance to purchase exclusive imports on a monthly basis, with each release being embedded in a wealth of information that educates the club member on its origin and genesis. If you are remotely into whisky and based in Australia, eventually you will come across The Whisky Club as it is a highly esteemed institution that finds approval from industry and connoisseurs alike. It is not further surprising that the club has a significant membership size, which in turn equips the club with significant buying power. Using the aforementioned buying power and its industry contacts, The Whisky Club is on a constant mission to source quality whiskies that its members will love and deliver them to them by importing the whiskies directly and exclusively for the club. Headed by whisky luminary Bertie Cason, known from his roles in industry peak bodies and who among other accolades is the gentleman that hand selected Sullivans Cove World Whiskies Awards winning expression and propelled the brand to one of the highest coveted whisky houses on this earthround, which changed the Australian industry forever, personally selects the club’s offerings. Needless to mention that the club has achieved a status and appreciation that has big whisky brands approaching them to exclusively launch new releases in Australia to establish an appreciation through the club’s reach and base of whisky aficionados before it trickles down the mainstream markets. While some clubs can be quite elitist and snobby, The Whisky Club embraces not only hard-core enthusiasts but everyone with a bit more refined interest in whisky and caters to their needs, with the individual bottlings being kept at an affordable range of AU$110-125 being only one of the features apart from offering members the chance to opt out and only buy what they would like to buy. A sign of quality as time has shown that once a member experiences the quality of the exclusive expressions delivered to the confines of their home, they grow used to it and appreciate exploring flavours and nuances they normally would have not tried. Offering its members access and discounts at Australia’s most prominent whisky haunts and thereby creating a national Clubhouse network or organising field trips are additional perks of joining the club for a whisky journey of epic proportions. July 2018 marked the fourth anniversary of the club and the way Armorik’s emission was presented was a spectacular “liquid birthday cake” and boy, what a drop it is! Living up to the flavour nuances it was being touted to achieve, i.e. crème brûlée and vanilla gâteux with hints of poached peaches, warming spice and toffee is quite, is no mean feat and expectations were exceedingly high before I even opened the bottle. 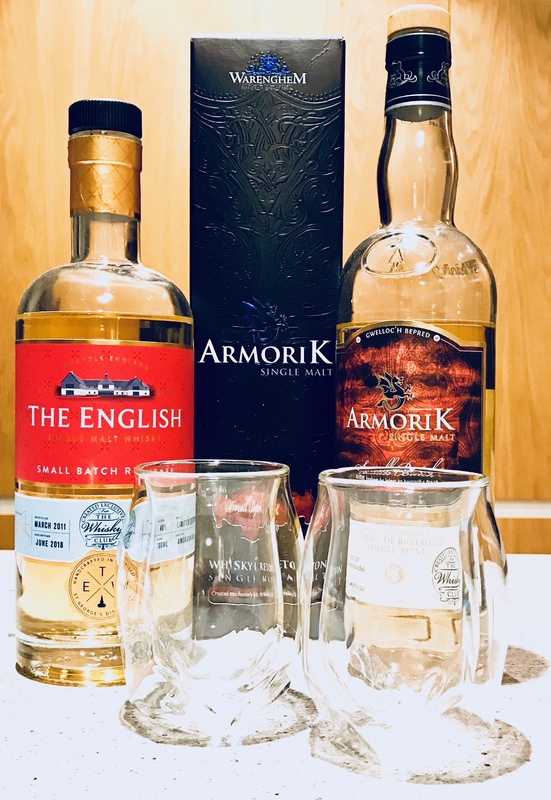 While the first sip of Armorik’s rich, golden yellow, fruity first one-hundred percent American oak matured single malt distillate was a thing of beauty, the way it evolves and grows slowly unfolding worlds of complex yet accessible flavour nuances is one indulgent exercise in decadence. The fact that I insisted my better half, who is a gin enthusiast, to at least sample it and see her demand a second helping speaks books about the quality of the drop. Calling the drop “moreish” is an understatement par excellence – a whisky of elegance that goes dangerously well with chocolate. As mentioned above, the Armorik Distillery’s (originally known as Distillerie Warenghem) small batch expression came with a wealth of information, shedding light on their artisanal ‘pâtisserie of whisky making’ in the Bretagne, France’s officially recognised whisky region, which features a similar climate to Scotland’s west coast. It was interesting to learn how the distillery sources its H2O from a hundred meter deep well called Rest Avel with the local granite bedrock making the water slightly acidic and helps develop fruity aromas during fermentation along with the use of barley from the Champagne region. Needless to say that Armorik takes full advantage of the local supply of casks that had previously been used for French wines and spirits, which are usually used for limited edition single casks. Let’s change a gear and have a look at The Whisky club’s August 2018 Whisky of the Month, shall we? United Kingdom’s small craft operation St George’s Distillery, which was established in 2006 under the benign guidance and curation of brewer by trade David Fitt presents The English Single Malt Small Batch Release exclusively created for The Whisky Club. Now, while the Armorik was French patisserie in a bottle, this little number is the English counterpart and an extension of the previous month’s offering: Layers of fruity nuances pervaded by hints of vanilla, nuts and milk chocolate. St George’s scrummy craft whisky The English, which matured in selected ex-Jim Beam casks is pleasant after the first sip yet grows exponentially with its sweet elegance, clean and crisp citrus textures that culminate in a melange of tropical fruits. Soft on the palate it leaves with that perfect hit of oak on top a bed of milk chocolate. Sounds like poetry in motion? Well, it is and it makes one giddy with anticipation of The Whisky Club’s next move: The Glenturret Single Malt Scotch Whisky, which as it is being fabled about around the campfire to be a well-balanced expression that encompasses a melange of BBQ, chocolate, salt and spice notes substantiated with an underlying smoke- and sweetness. Okay, seriously, sisters and brethren – I take that we are enjoying and experiencing whisky and not shooting it? Sipping whisky is a savouring pastime and it demands an appropriate vessel. A vessel that allows you to experience all nuances of its appearance, smell and subtle nuances. After all, the right glass can enhance your indulgence with its thickness, shape, size, grip, weight and, possibly most importantly, the nosing capability. Now, you might like the heft of crystal tumbler housing your whisky on the rocks. Sure, looks good but that method does not necessarily channel the whisky’s aroma in the best manner possible. I never got into snifters, so I cannot really tell what merits they may have but I find them not to be the easiest to drink out of. The tulip shaped Glencairn, which has been specifically developed for enjoying whisky has become my go-to over the years as I find it to combine the best qualities of all different whisky glasses. Given the good job it does and the fact that it is easy on the eye, I do not find it further wondrous that it was the first one that has become officially endorsed by peak bodies like e.g. the Scotch Whiskey Association. 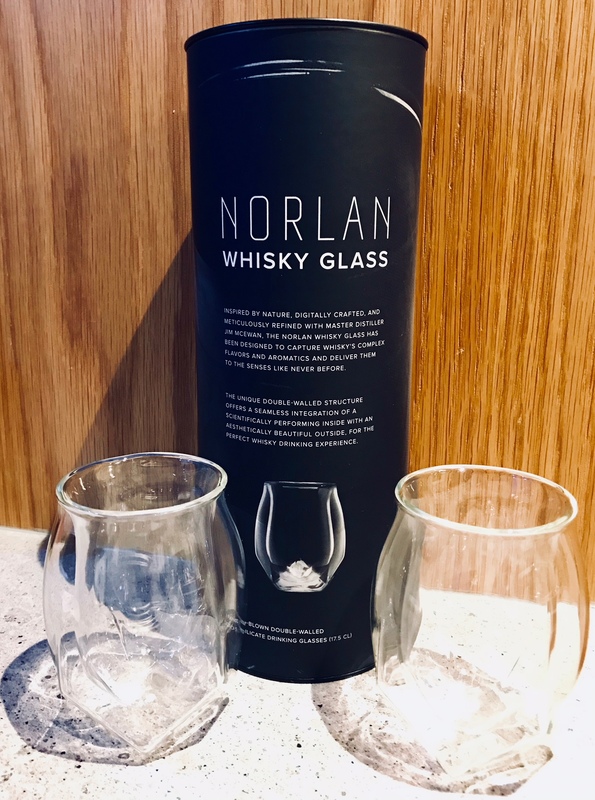 Recently I was introduced to a Norlan, a brand that focuses on modernizing the whisky drinking pleasure through design and a scientific approach. They have designed a hand-blown lightweight whisky chalice made of a type of glass with silica and boron trioxide as the main glass-forming constituents. Gimmick of the goblet is the transparency the two different molds provide, which have been fused and sealed together. The result is an aesthetically pleasing hollow body glass with the outside shape being the diametric opposite of the inside shape. The inside of the mug does wonders for aeration adding character and depth to the expression of the whisky you are nipping from. Apart from having an interesting shape, the whisky drinking experience is enhanced by its concaveness which naturally meets the lower lip of your pie hole. A glass I’d recommend to both casual aficionados as well as connoisseurs as it combines an attractive aesthetic with the functional qualities known from glasses like the Glencairn.